To define the term 'drawing' in the case of Frances Hodgkins, is difficult. Assessed for a good part of her career as a watercolourist, sketching for her implied making rapid notations with her brush in front of the motif. On the other hand, if one ventures to describe her later watercolours and gouaches, which are less concerned with appearances in the Impressionist sense, it is impossible to refrain from using the term 'calligraphic'. Among the first examples of Hodgkins's drawing are pencil studies of the late 1880s, found in small sketchbooks, which caricature members of the Hodgkins family. By the mid-nineties the artist was producing separate and more finished drawings of friends and family in charcoal or pen and ink. Then in 1898 and 1899, with the prospect of travel abroad, she embarked on a series of popular illustrations for the Otago Witness and the New Zealand Illustrated Magazine. Taken in all, these early works were unexceptional, being treated at first merely as a diversion, then more seriously in the light of a vocation, or in the case of the illustrations, strictly for remunerative ends. When Hodgkins finally left for Europe in February 1901, her express purpose, according to the The Evening Post(2) was to study drawing under English masters. After two months at the London Polytechnic under Borough Johnson, 'famous for his exquisite pencil work' she joined Norman Garstin's class in Caux de Bec and received flattering acclaim for her watercolours. For a number of years her output appears to have been almost exclusively in this medium. From the outset, Hodgkins was given more credit for her ability as a colourist than for her draughtsmanship, and over the years her champions repeatedly asserted that colour alone was the structure and life of her pictures. Without totally denying the truth of this, such an opinion tends to overshadow the not insignificant achievement of her work in pure drawing. These images have rarely been singled out for appraisal and only from the twenties onwards do they appear to have been shown publicly in any number. 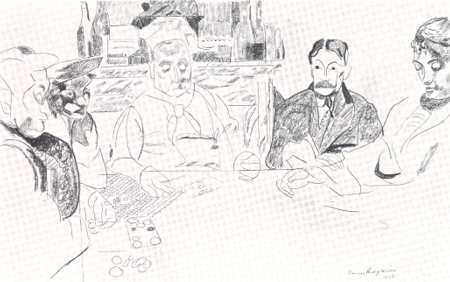 There is reference, in a letter to her brother Willie, to an exhibition of black and white drawings being shown in London at the end of 1923, at one of the smaller galleries. (3) Catalogues, however, to her more important exhibitions do not list drawings until 1940, and they are most generously acknowledged in the artist's Retrospective Exhibition at the Lefevre Gallery in November 1946. Along with twenty-three oils and forty-one watercolours and gouaches, seventeen drawings were shown. The practice of using pencil and chalk appears to resume in quantity only when she began to broaden her repertoire and paint in oils. Drawings are made for myriad reasons. Often in the work of one artist one discovers a wide variety of aims: some drawings made for later use in a painting, some which are 'finished' and intended for exhibition, a compositional sketch from the imagination, others made as gifts, etc. Generally, the specific intention dictates choice of medium, size, manner and style. Frances Hodgkins was no exception and in the following examples an attempt is made to sort out her motives for pure drawing. As the artist rarely dated her work after about 1907, or if a year is given it has generally been in retrospect, a certain amount of conjecture is inevitable. pencil, 526 x 356 mm. 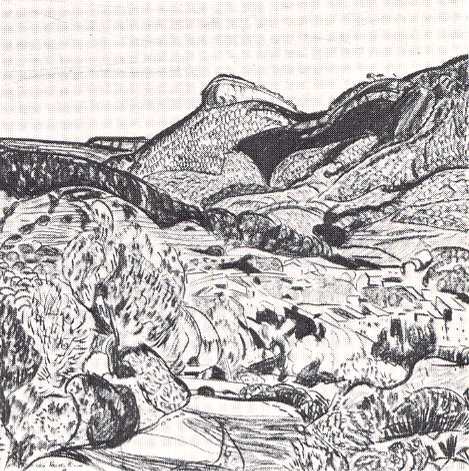 The bold patterning and vigorous interplay between light and dark do indeed suggest that the artist intended these works to be reproduced as black and white lithographs, but despite the apparent interest shown in the Cassis drawings and the earlier support given by the influential journalist (Rutter wrote the foreword to Hodgkins's 1920 exhibition of watercolours) the scheme failed to eventuate. It is quite possible, however, that they later went on display at her exhibition of drawings in 1923. The artist had entered the most testing and experimental phase of her career. No longer content to rest on her previous reputation and continue producing atmospheric watercolours with the lightness of Wilson Steer, or the bravura of Brangwyn, she now searched for new ways of expression, taking her cue from the Post-Impressionists and late Cubists. 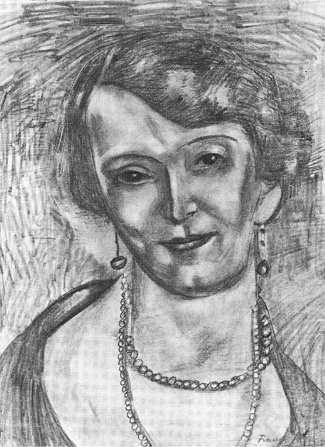 Further drawings in black chalk, which like the Cassis works are characterised by an unpretentious directness, continued to emerge from her continental excursions. Chez M. le Chef is dated 1926, but is more likely to belong to a year or so later. It is one of a number of sketches which provide an intimate glimpse of the resorts familiar to Hodgkins in the South of France. These are journalistic in essence and display the sure line of a skilled caricaturist. 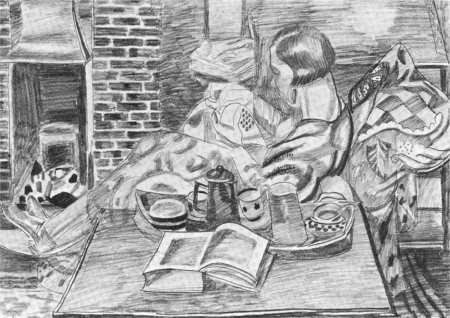 Chez M. le Chef was evidently prized amongst her drawings, for it was selected for inclusion in both the Retrospective Exhibition of 1946 and the 1949 survey exhibition, Homage to Frances Hodgkins. The clarity of the Mediterranean light which contributed to such a bold technique, is absent from the little hamlets she drew in the Cotswolds and elsewhere in rural England during the twenties. . . .'dreary little Burford, where the sun hardly ever shone & the people were so good & dull & learned' may not accurately describe the locality of Village Scene but the remark is nevertheless in sympathy with this soft, twilight landscape.' Formerly in the possession of the dealer Lucy Wertheim, the drawing is now privately owned in New Zealand. 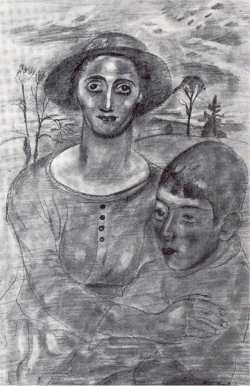 Like the Cassis works, it is a direct recording of a particular place and it reappears in the background of the pencil drawing Mother and Child, one of several versions which are early instances of the artist's composite motifs. Woman Reading may be regarded as the English equivalent of the French pension scenes Hodgkins delighted in sketching. It was exhibited at her Retrospective Exhibition with the date 'circa 1930' and one can imagine it being drawn one evening in a basement bed-sitting-room, in the company of a close friend. Other drawings, which are specific portraits of her associates, Woman with Pearls for example, were presented as gifts. 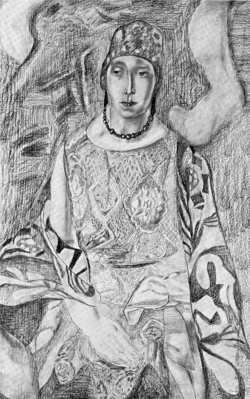 In this particular work, now in Auckland, the likeness of Dorothy Selby is strongly modelled in pencil in a manner not unlike the portraits of Andre Derain or the less well-known Moise Kisling, who were widely acclaimed in France at the time. They were both part of the new wave of naturalism which, under the leadership of Matisse, attracted almost all the young artists during the period 1918-1924. This was also the time when Picasso turned from Cubism to a structurally firmer art, and produced solid neoclassical figures. Before the 'twenties were out, Hodgkins had herself created 'so complete a statement in the formal sense that a sculptor could carve from it'. (8) The writer, John Rothenstein, who became director of the Tate Gallery in 1938, was referring to Seated Woman, an impressively large black chalk drawing which he believed was one of the finest drawings of the time. Keen to acquire it for the public collection, he finally succeeded in 1948. Previously, Seated Woman had been exhibited at Heal's, the exclusive department store in Tottenham Court Road, where it was skied; but later, when the work was shown in Edinburgh it attracted due attention. One of the first of Hodgkins's large, elaborate black and white drawings to appear, it measured approximately three by two feet and outmatched in scale most of her gouaches and many of her oils at the time. Nevertheless, Seated Woman is a curiously unresolved work, The half length figure, dressed in a heavily brocaded gown of the 'twenties, relates uneasily to her background, It was not until 1932 or 1933 that Hodgkins was able to integrate successfully the forms of her imaginative compositions. Flute Players, the first example seen in New Zealand of the large, fanciful pencil drawings, portrays two young men, half length, against a floral background. This drawing is less highly worked than Seated Woman, Hodgkins has sparingly used line and tone with all the mastery and verve of Raoul Duty at his best. 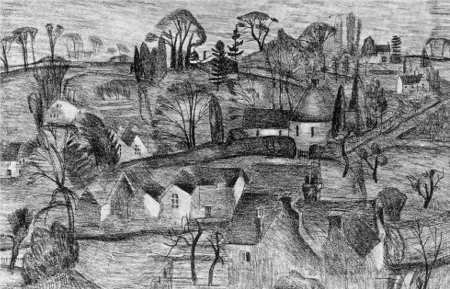 By the early 'thirties she had finally emerged from provincial obscurity and entered the ranks of the English modernists, She became a protégé of Arthur Howell, director at St George's Gallery, where her exhibition in October 1930 attracted enviable reviews. The previous year, Hodgkins begun exhibiting with the progressive Seven and Five Society, where her particular brand of lyrical naturalism shone in the company of fellow members of similar persuasion - Ivon Hitchens, David Jones and Winifred Nicholson. Throughout her career, she appears to have kept sketchbooks, many of the sheets bearing small working studies in pencil with colour notes alongside. Often they were intended for objects in particular compositions, such as The Bird Cage, an oil originally acquired by Lucy Wertheim. 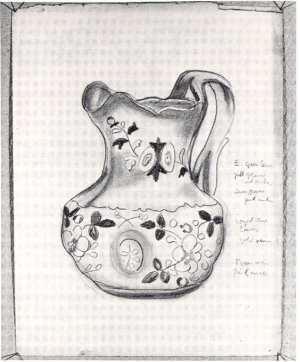 These drawings could either be summary in treatment, as with the study of the vase to the left of this painting,' or more carefully observed, as with the Jug below. Employing all the Post-Impressionist paraphernalia for the still lifes which she now concentrated on - the vases of flowers, compotiers of fruit, decorative cloths - Hodgkins invariably placed them in association with landscape. These were her so-called 'open air still lifes'. At times, she still too self-consciously brought heterogeneous objects together, trying to make a composition of things in real life instead of seeing them in abstract terms as she did later. 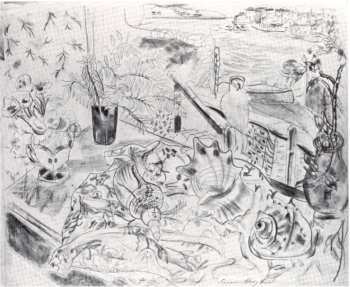 But already, in the early 'thirties, as witnessed in a pencil drawing of around 1932, belonging to the British Council, she has brought together, in a series of sweeping curves, separate still life objects which hold together organically like a plant, and merge quite naturally with the landscape beyond. This image, characteristic of her mature style, is permeated with light and has the texture and sheen of satin. The same effect, translated into paint, can be seen in the two versions of Wings over Water. pencil, 514 x 610 mm. 1. Philip Rawson, The Appreciation of the Arts No.3: Drawing, Oxford University Press, 1969. 3. Letter to W.J.P. Hodgkins,12 ApriI 1924. 'In Dec. last I had a small show of black & white drawings at a minor & less well known gallery in London - in this case the guarantee was waived - I sold £35 of Drawings - frames cost me £15 - Dealer kept £12 - I the rest!' Recorded in E.H. McCormick, The Expatriate, Wellington 1954, p. 196. The exhibition was in fact held at the little Art Rooms, 8 Duke Street, Adelphi. 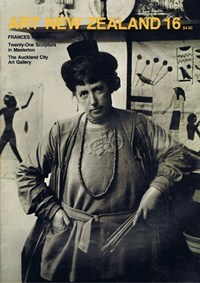 See McCormick, Works of Frances Hodgkins in New Zealand, Auckland 1954, Chronology p. 250. 4. The Expatriate, pp. 191-2. 5. 4 February 1921. letter recorded in E.H. McCormick, 'Some Recently-Acquired Drawings by Frances Hodgkins', Auckland City Art Gallery Quarterly, No. 58. 6. Letter to Rachel Owen Hodgkins, 14 April 1921, recorded in The Expatriate, p. 183. 7. Letter to Rachel Owen Hodgkins, 3 December 1923, recorded in The Expatriate, p. 193. 8. John Rothenstein, Modern English Painters - Sickert to Smith, London 1952, p. 119. 9. Vase with Handles - notes for colour, Pencil, 279 x 229 mm., Auckland City Art Gallery. 10. The other oil exists in Leeds City Art Gallery. 11. The Listener, 2 October 1941.